As an attendee at a recent Bipartisan Panel on Restoring Voting Rights, I was thrilled to see the energy of this movement and the surprising diversity of its supporters. The Capitol Hill briefing featured introductory remarks from U.S. Senators Ben Cardin (D-MD) and Rand Paul (R-KY) on their respective bills (S.2235 and S.2550) seeking the restoration of voting rights for formerly incarcerated people. 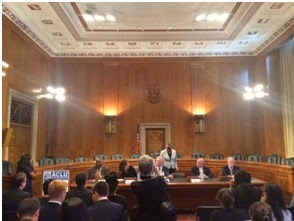 The senators were joined by moderator Nicole Austin-Hillery of the Brennan Center for Justice and an eclectic panel of experts representing the faith, civil rights, criminal justice and law enforcement communities. The bills reflect the remarkable dialogue that is occurring now among politicians from both sides of the aisle. Panelist Deborah Vagins, senior legislative counsel on civil rights issues at the ACLU, remarked on the recent realization among conservatives that easing restoration requirements does not need to be a partisan issue. Another panelist, Desmond Meade, the state director of PICO Florida’s Lifelines to Healing Campaign and president of the Florida Rights Restoration Coalition (FRRC), commended the senators on “rais[ing] this issue above the fray of partisan politics.” Despite policy differences in the past, Senators Cardin and Paul have joined forces to ensure that “youthful mistakes,” as Sen. Paul called them, do not result in life-long punishments. Although both bills target federal voting rights, Sen. Paul’s bill is limited to restoring voting rights for people with convictions for nonviolent offenses. Sen. Cardin’s bill, the Democracy Restoration Act (DRA), is more expansive and does not make the distinction between violent and nonviolent offenses. Create an automatic notification procedure. Panelists agreed that disenfranchisement should never be wielded as a punishment because of its severe and enduring nature. Meade stated, “While release may have been granted, access is still being denied.” This denial of access to a fundamental right of citizenship is a “national disgrace,” according to Vagins. Rev. Dr. H. David Schuringa, president of Crossroad Bible Institute, impressed upon the audience that disenfranchisement leaves a “lasting scar on citizens.” Bernard Kerik, former New York City Police and Corrections Commissioner, remarked on the permanency of the punishment: “In our current system, you do your time, but your debt to society is never paid.” The panelists’ opinions echoed Sen. Cardin’s belief in the importance of “correct[ing] this terrible injustice that we have in our society.” Kerik was recently released from prison and spoke about how his time in prison showed him, firsthand, the failings of the criminal justice system. Furthermore, the experts concluded that encouraging engagement in communities as active citizens is a critical, and missing, step in the re-entry process for people released from prison. Dr. Schuringa condemned the retention of an “awful ambivalence” towards the formerly incarcerated population, people relegated to the outskirts of society as second-class citizens. Carl Wicklund, Executive Director of the American Probation and Parole Association, contended that the withholding of civil rights from this population does not serve a rehabilitative or public safety purpose and prevents formerly incarcerated people from practicing pro-social behavior. The facilitation of formerly incarcerated people’s reintegration back into the community as productive, participatory citizens will reduce recidivism and makes the Democracy Restoration Act smart on crime. The ACLU’s recent report, Out of Step with the World, states, “This nation that prides itself on free and fair elections and voting shuts out more citizens from the democratic process than any other nation in the world.” Sen. Cardin said we “need to take care of business at home” to ensure our credibility as a proponent for democratic development world-wide. Wicklund concluded his remarks by referencing Oscar Wilde’s saying: “Every saint has a past, and every sinner has a future.” This reminds us of the importance of forgiveness and second chances. It’s time to allow those released from prison to have a future. Hope DeLap is a rising senior studying Criminology, Law and Society at the University of California, Irvine.